Camping is fun, but we are a bit spoiled with our toys and gizmos. Entertainment is found in abundance through a single device, our phones. When we visit the great outdoors, our mobile is only going to last about a day. That means the number of pictures, videos, and meaningful messages you can post to social media will be limited. If the thought of that makes you anxious, then you’ll want to make sure you have a way to keep your cell charged and at the ready. 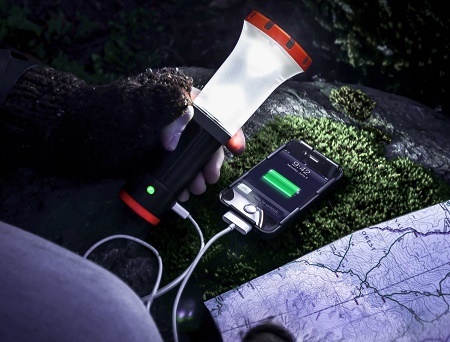 If you like using devices that have more than one purpose, then maybe the UCO Arka XP-E CREE 180-Lumen LED Flashlight Lantern and Portable Charging Station for USB Devices can help. It’s a bit obvious, but this device will act as a flashlight, lantern, and charging hub. It houses a rechargeable 3.7V, 4AH Li-Ion battery that will charge up your phone, camera, GPS, and more. You’ll be able to charge your phone to 100%, and still have around 4 hours of bright LED light, or 25 hours or low light. If you’re only using this as a lantern/flashlight, it will burn on high for 6-8 hours and 50 hours on the lowest setting. You can control how bright the light is by pressing and holding the button. It will start on the highest setting, and will gradually dim. Whenever you’ve hit the level of brightness you desire, remove your finger from the button and it will stay set. If you need a night vision preservation mode, press and hold the button for two seconds, and it will give you a bright red LED light. If you click the button again at this point, it will begin strobe mode. One more click and it will begin an S.O.S. Emergency strobe mode. There’s a loop on the top so it can hang from anywhere, and it is also somewhat waterproof. This will cost you around $55, and needs about 8 hours of being plugged in to give you the full benefits. In other words, make sure you use the power it would provide you with wisely.